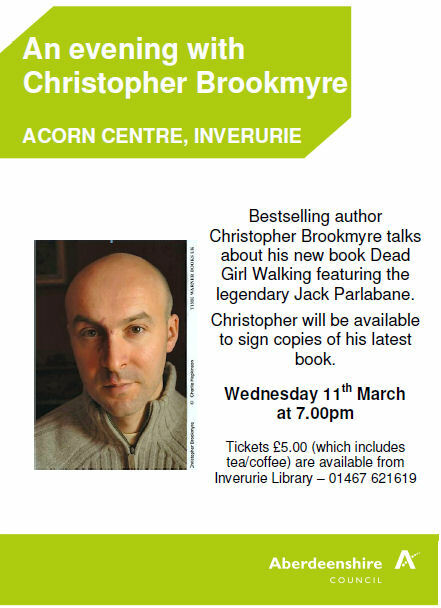 Bestselling Scottish author Christopher Brookmyre will be appearing at the Acorn Centre, Inverurie as a guest of Aberdeenshire Libraries, at 7.00pm on Wednesday 11th. March. Fans of Christopher’s books will already have met the legendary Jack Parlabane, and will not be disappointed with this latest engrossing, thrilling and page-turning adventure. Contact Inverurie Library to book a ticket and join us for a lively evening on the 11th. Borrow any of his books from the library before or after the event. Books will be available for purchase on the night, courtesy of Waterstones.